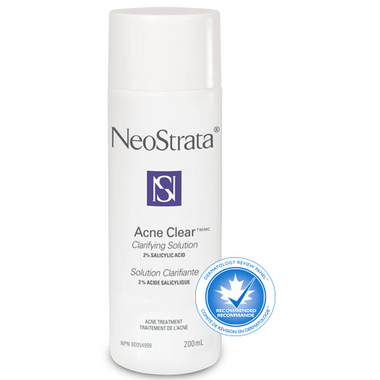 NeoStrata Acne Clear Clarifying Solution is a highly concentrated, antibacterial toning solution that exfoliates, purifies and deeply cleanses acne-prone skin. We are only able to ship this item to Canadian customers. This is a great product. It clears my acne, prevents future breakouts if used regularly, unclog my pores, and keeps my skin smooth. It's surprisingly gentle on my normal to combo skin. There is a little tingling at first, but it hasn't irritated my skin so far. It's a thin, clear solution and lasts quite long despite the consistency ( I don't use it with cotton pads). I used it off and on for a while and my skin did better whenever I used this. This is a true gem. Excellent for keeping pores clean. Dries up acne pretty quick and lessens appearance of lines. Only downside for my combination skin is the stinging - it can be a bit irritating to the skin especially when you first start. Build up tolerance! This is a great combination of glycolic and salicylic acid. Most difficult acne needs at LEAST this amount. When you hit a bad stretch of breakouts, using it morning and night will clear you up! Works! It's the only product that cleared all my bumps and old clogged acne laden skin. Recommended. Been using this product for several weeks now. Started by using it once at night and now switched to twice a day (morning and night). This product is the first acne clearing solution that did not dry out my face or give a flaky appearance. My face feels much cleaner afterwards and I'm starting to see results (less aggressive breakouts and a decrease in clogged pores). I do recommend wearing sun protection and sun screen at all times, as this product does make your skin extremely sensitive to the sun (as do most acne therapy products), to avoid sun spots or hyper-pigmentation. This is the first time I've purchased this for my teenager. you have to use it 2-3 times a day for it to work. It works and doesn't dry out the skin. By week 2 you'll see it working.